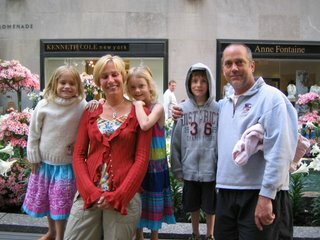 We had never been anywhere quite like NYC with the kids. Thus, we were apprehensive about how things would go in the hotel, as well as when we walked around the city. We were only there for about 24 hours, so we thought "what could go wrong". Gotcha, this time things went perfectly. The photo was taken at Rockefeller Center. We got to our room at the Affinia 50 in Midtown East (highly recommend it by the way) and checked into a nice suite with an decent size outside terrace. Went around the corner and got some sandwiches and milk for the kids, and some wine for Mom and Dad. After the kids ate they dozed off, having been on the go the entire day. Sofia and I quickly accessed the internet and found a highly rated Indian restaurant that delivered. We took a table and chairs and set up a little dining al fresco area on the terrace. Ten minutes later we were nibbling away on great food, enjoying good wine and taking in the sight and sound of NY. It was a nice reprieve from a very "kids" oriented trip. The following day, we took the kids to Times Square, to Toys R' Us. (the transformation of NYC over the last twenty-five years is remarkable - who would have thought of a family outing to Times Square back then???) Upon arriving we informed them that they all had $50 to spend, and they could get whatever they wanted. What a study in human behavior. They really got the idea of prudent allocation quickly. While their styles varied, I was impressed by how they thought through their choices. Karl went more for a couple of more expensive things that he really liked. Alex got a couple items which were somewhat expensive and mixed some small items with that. Erika was all about quantity. She didn't buy anything over $10, and she had the most items by a wide measure. Nonetheless, they all left very satisfied with the outing and have high hopes this will be an annual event. The rest of the trip was running around trying to make sure that anything we needed back in Sweden could be bought in NY. Even leaving aside value added tax, Sweden can be stunningly expensive for some items. Our shopping trip concluded with the purchase of an additional piece of luggage to haul the goodies back to Scandanavia.